Welcome to A Joyful Noise! We believe that everyone can sing and should have the chance to do so. We provide safe, encouraging and supportive learning opportunities for everyone who wants to sing. A Joyful Noise is an inclusive organization. To make sure there is an opportunity to sing for everyone we offer three non-auditioned choirs and everyone is welcome. You can choose which choir you wish to join depending on what you are looking for in a choir, how much experience in choral singing you have, and what kind of commitment you will bring. To make sure you find the choir that is the best fit, we encourage you to read about the choirs by clicking on About the Choirs. As you read about the choirs you will see that they all have an emphasis on learning and experiencing the joy of singing. Besides weekly rehearsals, A Joyful Noise offers members of all three choirs additional learning opportunities such as small group rehearsals and workshops in music theory and improvisation. You will find yourself capable of doing things you never thought you could, while having fun and enjoying the company of others in our choral community. Who is A Joyful Noise? We’ve come along way since we started out in 2004! We began with one choir for people who believed they couldn’t sing. In fact, our members thought they couldn’t carry a tune in a bucket! Under the guidance and leadership of Artistic Director and A Joyful Noise founder Eva Bostrand, those 30 brave souls who signed up the first year soon found their voice. By the end of the first year, they were able to perform a concert for their friends and family. By the next year the membership in that choir had doubled and the numbers continued to grow each year. By 2008, so many people wanted to join A Joyful Noise that we had to start a second choir. Over the years members of both choirs continued to learn and to improve their confidence and skill. As the choir members became more advanced, it became difficult for those with no background in choral singing to join. So in 2014 we started a third choir to make sure there is a welcoming environment for everyone who wants to sing. Who joins A Joyful Noise? Some have sung in choirs their whole lives and want to continue to develop their musicianship in a challenging and inspiring environment. Others haven’t sung since they were in school and want to rediscover the joys of choral singing. And some have never had the opportunity to sing in a choir before and honestly believe they cannot carry a tune in the proverbial bucket. Each one of them finds a place in one of our choirs. Our rehearsals will begin again as follows: Monday Choir starts on September 17, Thursday Choir on September 20, and Wednesday Choir on October 3. What are the three choirs? Here is a quick overview of our choirs. For more information please click on About the Choirs. Rehearsals for Wednesday choir are structured like a choral class. No previous choral experience is necessary and members learn the building blocks of choral singing and have a chance to try out the new knowledge by singing fun and interesting repertoire. Wednesday choir does not perform in any formal public concerts. Monday choir is the place for you if you want to develop your confidence as a choral singer. No previous choral or music experience is required. During the choral year the choir will typically learn two different concert programs which it will perform in a variety of settings, from formal concerts to outreach performances in seniors’ homes and hospitals. From time to time Monday Choir also enjoys going on a road trip and participating in out of town workshops. To cap off their year, singers tell us one of the highlights is the annual Talent Night when they get a chance to perform for each other in a fun and relaxed setting. During the choral season the choir will typically prepare three concert programs of more challenging repertoire to be presented in concerts. As with the other choirs, no audition is required. However, to feel comfortable with the level of difficulty and amount of repertoire, some musical knowledge or choral experience is necessary. Travel is also a part of Thursday Choir’s choral year. Some years the road trips are within western Canada but other years the choir goes on an international tour to such wonderful destinations as Iceland, Malta, and Sardinia. This year’s adventures will see Thursday Choir journey to Saltspring Island May 10 – 12, 2019 for a workshop and performances. How do I choose which choir is right for me? The choice is yours! You don’t have to audition and you can pick which choir would be the best fit for you. To help you in your choice we suggest you read the descriptions of the choirs and think about which one best suits your experience and learning goals. If you would like some help with your decision, send us an email at info@ajoyfulnoisechoir.ca and we will help you decide. To find out more about the choirs, please click on About the Choirs. For more information about how to decide which choir might be right for you, click on How to Decide Which Choir to Join. 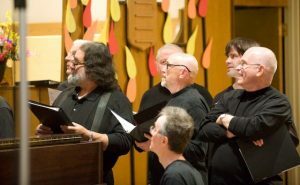 Here’s another good way to find out what singing in a choir is like: check out the Summer Sampler offered by A Joyful Noise and led by Eva for three evenings August 21 – 23. This is a drop in workshop that gives prospective singers a chance to explore their singing voice, and returning singers the opportunity to get ready for the upcoming choral season. Further information about the Summer Sampler is available here. Daytime Drop-In Choir – Tuesdays at 11 a.m. Sing your stress away in this non-auditioned drop in choir. There are no performances or ongoing commitments and all voices are welcome. The conductor is Cheryl Balay. The website is currently under development so for further information you can call/text Cheryl at 780.667.4607 or email cheryl@sing4me.ca. Authentic Voice – Group Voice Class Tuesdays at 7 p.m.
Singer, composer, and teacher Anna Beaumont offers group classes for those who wish to find Freedom and Release in their life through Singing and Expression. For more information click here.